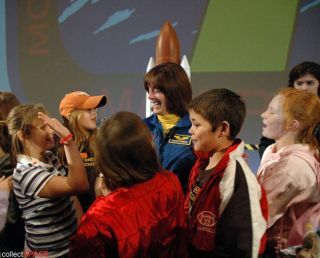 NASA educator-astronaut Barbara Morgan meets with students at Space Center Houston in Texas on Jan. 19, 2007. When educator-astronautBarbara Morgan launches to the space station this June, she hopes to 'plantthe seed' that that willstart students thinking about their own futures in space. In additionto Morgan and her six STS-118 crewmates, space shuttle Endeavour willhave on-board millions of basil seeds, which will be distributed after themission to children in kindergarten through high school working to developtheir own designs for Moon- or Mars-based plant growth chambers. "Weknow they will be excited about having the seeds, something physical that has beenin space that they can touch and grow," Morgan told collectSPACE.comduring an educational event held Friday at Space Center Houston [image]. "There'sa little bit of a metaphor there, its really planting the seed to get themgoing, it's getting something physical in their hand that they can go and dowhat we do - explore, experiment and discover," explained Morgan. The flownbasil seeds will be used by students to test their own designs for growingplants and food on other planets. Morgan will formally announce the"engineering design challenge" while in space but is sharing thebasic details now so that teachers can incorporate the project into their falllesson plans. Morganwants to involve students in real space activities to teach them how the canplay a part in their own future. "Wewant them to understand that our mission, and all these series of missions, arejust one and long step into an open ended future. So we're going to help finishbuilding the InternationalSpace Station, that leads on to us going to the Moon and on to Mars. Right now, as you know, we areworking on the exploration vehicle and how we are going to get to the Moon andhow we are going to get to Mars," continued Morgan. "[For] thesekids... and even high school seniors today, that will be figured out by thetime they are in graduate school but there's lots and lots of stuff that hasn'tbeen figured out at all yet." "Wewant to get them engaged now figuring out that stuff so they can actively contributeto advancement now and not just by absorbing knowledge from us but by workingwithin and working together on these problems that haven't been solved,"Morgan described as her motivation behind the plant growth chamber challenge. Studentsparticipating will be able to compare the basil they grow on Earth with seeds planted on-board theISS. "Weare also taking up a growth chamber that we will be transferring over tostation and Clay [Anderson, STS-118 crewmember and station resident,] willstart and continue the growth of these basil seeds," Morgan said. In additionto the seeds, NASA is planning for Morgan and perhaps her crewmates toparticipate in as many as three educational "downlinks" when she willanswer students questions from aboard the shuttle and station. "Rightnow we are still negotiating that with the mission operation folks to find outhow much time we have and what type of activities we can do," said RobertMusgrove, deputy director of the education office at NASA Johnson Space Centerin Texas. Beyond hereducational duties, Morgan will help operate the shuttle's robotic arm duringthe planned11-day flight that will deliver and install a new station truss segment,bring supplies and will replace a U.S. crewmember living on-board the orbitinglaboratory. Named a member of the 1998 NASA astronaut selection group, Morganleft her career as an Idaho teacher and has trained as a full-time astronaut since. Morganpreviously was selected as back-up to America's first teacher in spacecandidate, ChristaMcAuliffe, who was tragicallykilled along with her Challenger crewmates 21 years ago on January 28,1986. Despite the accident, Morgan remained committed to flying in space.STS-118 will be her first mission. Morganknows that McAuliffe's memory will be forefront during the flight. "Ican't imagine that people aren't going to be thinking of her, thinking ofChrista, and not just her but the whole Challenger crew. They will be therewith us," said Morgan.